IC Insights has raised its worldwide IC market growth forecast for 2017 to 11%—more than twice its original 5% outlook—based on data shown in the March Update to the 20th anniversary 2017 edition of The McClean Report. The revision was necessary due to a substantial upgrade to the 2017 growth rates forecast for the DRAM and NAND flash memory markets. IC Insights currently expects DRAM sales to grow 39% and NAND flash sales to increase 25% this year, with upside potential from those forecasts. DRAM market growth is expected to be driven almost entirely by a huge 37% increase in the DRAM average selling price (ASP), as compared to 2016, when the DRAM ASP dropped by 12%. Moreover, NAND flash ASPs are forecast to rebound and jump 22% this year after falling by 1% last year. The DRAM market started 2017 the way it ended 2016—with strong gains in DRAM ASP. In April 2016, the DRAM ASP was $2.41 but rapidly increased to $3.60 in January 2017, a 49% jump. A pickup in DRAM demand from PC suppliers during the second half of 2016 caused a significant spike in the ASP of PC DRAM. Currently, strengthening ASPs are also evident in the mobile DRAM market segment. With total DRAM bit volume demand expected to increase by 30% this year and DRAM bit volume production capacity forecast to increase by 20%, IC Insights believes that quarterly DRAM ASPs could still surprise on the upside in 2017. Furthermore, DRAM output is also being slowed, at least temporarily, by the ongoing transition of DRAM production to ≤20nm feature sizes by the major DRAM producers this year. At $57.3 billion, the DRAM market is forecast to be by far the largest IC product category in 2017, exceeding the expected MPU market for standard PCs and servers ($47.1 billion) by $10.2 billion this year. Figure 1 shows that the DRAM market has been both a significant tailwind (i.e., positive influence) and headwind (i.e., negative influence) on total worldwide IC market growth in three out of the past four years. Spurred by a 12% decline in the DRAM ASP in 2016, the DRAM market slumped 8% last year. The DRAM segment became a headwind to worldwide IC market growth in 2016 instead of the tailwind it had been in 2013 and 2014. As shown, the DRAM market shaved two percentage points off of total IC industry growth last year. 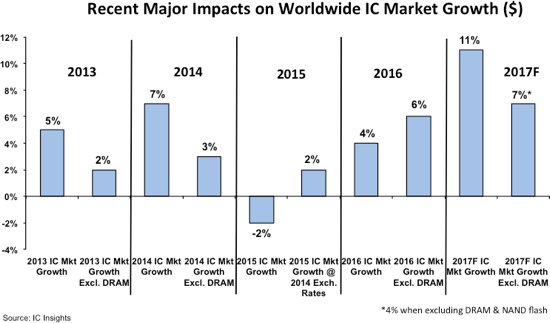 In contrast, the DRAM segment is forecast to have a positive impact of four percentage points on total IC market growth this year. It is interesting to note that the total IC market growth rate forecast for 2017, when excluding the DRAM and NAND flash markets, would be only 4%, about one-third of the current worldwide IC market growth rate forecast including these memory devices. The March Update to the 2017 edition of The McClean Report further describes IC Insights’ IC market forecast revision, updates its 2017-2021 semiconductor capital spending forecast, and shows the final 2016 top 10 OSAT company ranking.